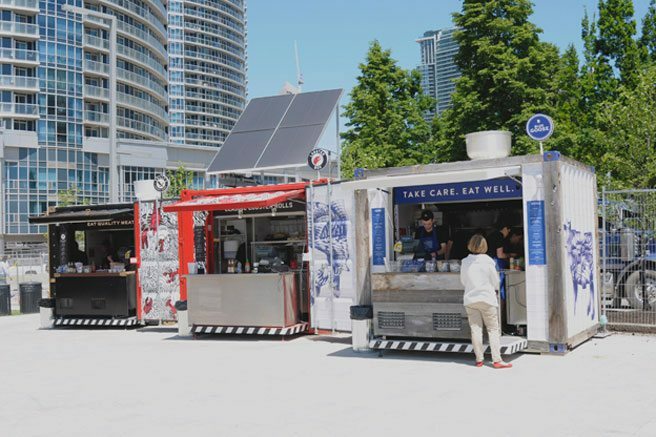 This summer Harbourfront Centre is introducing to Toronto to Muvbox: steel shipping containers that have been re-purposed into solar powered kitchens. Muvbox is an international project, having locations in New York City, Montreal and Paris. Harbourfront Centre is lucky enough to have three boxes: Sully’s Honest Dogs, Lobster Roll and Blue Goose. Last week I meet my sister Liz after work and we checked out the food crates. I ordered the lobster roll with a side kettle chips and pomegranate with hibiscus ginger soda from Lobster Roll. The soda I ordered was the pomegranate with hibiscus from Fresh Ginger. I first tried this about a month ago when we were in Buffalo, and I thought it was one of those delicious things that can only be found in America. But no! You can get it here!!! It is so delicious you should all venture down to Harbourfront for this alone. Liz ordered the organic beef burger from Blue Goose. Everything was delicious and there is even more deliciousness to try. Sully’s has hot dogs inspired by the neighbourhoods and flavours of Toronto: “The Danforth” (thick Tzatziki, olive tapenade and feta), “Hot Dogchimi” (sesame glass noodles, kimchi, roasted garlic mayo and wakame seaweed), “Banh Mi Dog” (mango salad, hot mustard, bean sprouts, sweet chili glaze and fresh basil) “Ano Yan” (crushed pineapple salsa, caramelized onions, pork rinds and garlic mayo) and “Little India” (vindaloo Curry, yogurt and mint). 5 different types of hot dogs to try – I am so down to spend my summer trying new hot dogs with unique and Toronto-inspired recipes. The food crates are only open seasonly and will close in October. You have four months to get down to the water and enjoy some food and some sun! Do it! A few weeks ago I went to Bent. I have been debating whether or not I should write about it because unfortunately, I got food poisoning for the first time. Food poisoning is terrible and I only had a very mild form which still left me in bed the next day. I didn’t want to talk about it because I don’t want to ruin Bent’s reputation because of the negative experience I had – not that I think I have the clout to do that. The servers were professional and the food was tasty but unfortunately, they did not deliver that night. 1. Bent is incredibly overpriced. It is a tapas-style restaurant which will always run a bit steep but unfortunately the portions were unsatisfying and small. Our server suggested that we only needed 2 plates each and this was an understatement. Ordering 4 tapas plates our bill, before tip, was almost $90. I understand it was seafood but you are paying for the name (Susur Lee) and unfortunately it is not worth it. 2. The service was incredibly slow. Our server was knowledgable and friendly but it took forever to get our food. Tapas plates come out staggered but it should not take over 2 hours to eat a meal of this size, especially when the majority of the food is raw. 3. We ordered the Nigiri Tasting Plate, the Tuna & Watermelon ceviche, the Lobster tacos and the Duck Salad. My favourite was the nigiri tasting plate. The ceviche would have been good in theory but the chunks of tuna and watermelon were too large and did not interact with each other in every bite. I am convinced it is the ceviche that got me sick – I think the watermelon improperly cured the tuna and messed my system up..
At the end of the day, this was your typical Toronto pretentious dining experience – overpriced, low quality, and ultimately not worth it. If you choose to go, don’t get sick! The last meal eaten out of 2012 at a restaurant we had not been to yet – The Rosedale Diner. Part of my New Year’s resolution is to eat out less in attempt to save money and lose a little bit of weight so unfortunately there will be less restaurant posts BUT more recipes! The Rosedale Diner was chosen for brunch on Boxing Day for its location and because it was one of the restaurants Guy Fieri visited on his Toronto vist for Triple D. It is a small diner that is crammed, busy and noisy – you would accept nothing less from a true diner. The food is not your typical greasy spoon dive food, it is healthy and fresh. We started off with the calamari. Crispy, tender and not chewy, this was perfectly cooked calamari. I wasn’t crazy about the sauce drizzled on top – it claimed to be a lemon caper aioli but it was slightly spicy with no citrus tang. I prefer my calamari to be dipped and in a citrus sauce of some sort. GC ordered the egg’s Benedict. A great but simple egg’s Benedict. It is hard to add anything new to this dish because it is so legendary to brunch and that’s fine. The hollandaise sauce, the mark of a good Benedict, was sweet, tangy, rich and creamy, it perfectly rounded out the dish. I ordered the Crab and Salmon Burger. Creamy, sweet but savoury, and with great hints of dill – delicious! I loved that this burger came in a pita rather than a burger bun and that it was simply dressed with lettuce, tomato and onion. It was very light, but filling and satisfying. Coconut curry was the flavour of the week this past week. I used it to make a sauce for chicken and then later, sale a sauce for mussels. 1. Mussels are my one of my favourite types of seafood, cure next only to scallops. I love how they perfectly pop open like a little ring box to show the beauty that is inside. They are tender, purchase fleshy and a little salty. The perfect morsels of the ocean. 2. This sauce was amazing. Light, and flavourful. There was a subtle fruitiness from the cilantro, red onion and tomato which emphasized the fruitiness of the mussels. The hint of spice from the curry was mellowed by the coconut milk. All of this goodness was absorbed into the mussels and later sopped up by crusty bread. 3. This dinner is made in one pot = sold. This is convenient, quick and easy. This is now going to be a dinner staple in our house. 4. If you are only making this dish for two people I would suggest using only one kilogram of mussels rather than the two that is suggested for making this meal for four people. This dish is very low in cost to make – we paid $4.99/kg of fresh mussels. 5. Mussels can safely be reheated the next day. Bring the broth back up to a boil and then add the mussels back to the broth. Simmer until the mussels are reheated but not cooked until they are rubbery. This will take about 5 to 10 minutes. On Tuesday our weekly date night found us in Yorkville at Ciao Wine Bar. No, we didn’t suddenly become wealthy and now we will eat in Yorkville regularly, we had a Groupon – $50 worth of food for $25. And what better night to go to Ciao than on their Linguine and Lobster Special Night? Every Tuesday Ciao serves up a plate of linguine in tomato sauce with 1.5lb lobster for $21 – this is an amazing deal and with our Groupon it was like we were eating for free (sort of…)! 1. This was a huge plate of pasta. And obviously, a lot of lobster. This plate isn’t for the faint of heart. If you are going to have this for dinner, have a light, early lunch. 2. The pasta was perfectly al dente and covered in a generous scoop of sauce. The sauce was sweet, yet tart, just like fresh tomatoes and was highlighted by the sprig of fresh basil. Fresh basil reminds me of summer and the fresh vegetables and herbs that come from the garden. 3. I loved that the lobster came already cut in half. Lobster is one of those foods that is apparently an aphrodisiac but you look revolting while eating it. Having the lobster cut in half allowed for civilized dining using a fork and knife. The lobster was fruity, tender and fresh. It worked perfectly with the fruity qualities of the pasta sauce to create a coherent plate. Although we were stuffed, we could not pass up the opportunity to have tiramisu. 4. There was too much stuff on top of this tiramisu. I like my tiramisu classic and simple: a few chocolate shavings and a sprinkle of cinnamon. There was far too much going on with this dessert. The chocolate was good but the shavings were too big and there was too many. The raspberries and blueberries were good, but the orange berries (I don’t know what kind of berries they are – any help here?) were bitter. 5. The tiramisu itself was creamy, with crunchy lady fingers and a subtle espresso flavour. Once you get over the mess on top, this is a tasty, little pick me up. Another delicious, simple meal at Ciao. Ciao is one of my favourite Italian restaurants in Toronto. Despite being in Yorkville it is decently priced and you are given huge portions. The ingredients are fresh and simple, exactly how Italian cuisine is. The atmosphere is cozy and comfortable – perfect for a family meal, catching up with friends or a romantic meal for two. In case you couldn’t tell, I love my birthday. And I celebrate it a lot, hence the excessive amount of posts related to my birthday and food. My birthday celebrations started on October 11th, with my actual birthday being on October 16th, and the last celebration will be on October 23rd. Ridiculous I know, but it is once a year so why not make a fuss about it! For dinner on my birthday GC and I went to Fishbar, a seafood tapas restaurant located at Dundas and Ossington. I first came across Fishbar on our first visit to this area for burgers at BQM and have been craving it ever since. My birthday seemed like the perfect opportunity to give it a try. Fishbar has a fantastic look, starting with its logo: a simple fish skeleton. It is slightly creepy but simple, and with the promise of you getting every drop of sweet, flaky fish. The restaurant features a long wall of exposed brick, which adds warmth and a touch of rusticness. The flooring is tile that has been weathered and treated to look like it has been there for years and has been tread on by thousands of people. Our favourite feature was a series of mirrors that were actually convex parking garage mirrors that reflected the scene of the restaurant. The back wall featured an extensive wine collection and served as art itself with its simplicity and sparkle. Behind the bar there were framed anatomical photos of seafood which illustrated the science behind the deliciousness you were enjoying. The design of this restaurant was cozy, but sophisticated and upscale. I felt so comfortable and at home, which is a great feeling to have before enjoying an amazing meal. We started off with drinks. GC ordered a Quebec beer and I ordered what was their take on a classic Caesar. So I can now officially get behind Caesar’s. This is the third one I have had and I loved #’s 2 and 3. Spicy, thick and a fresh taste like a summer garden, I loved it. The shrimp garnish of this Caesar was a thing of beauty all on its own. It was meaty, thick and fresh and the spiciness of the horseradish contrasted the fruity notes of the shrimp. The horseradish was freshly grated, spicy but tasty. A cocktail is a must at this restaurant. Tonight I met up with Cynthia and we checked out the new Museum Tavern across from the Royal Ontario Museum on Bloor Street. Museum Tavern has a great patio that overlooks Bloor St with bistro chairs and tables. The only downside on being located on a busy street is that the tables were covered in a fine layer of street dust – the joys of al fresco dining. The interior was gorgeous and I am definitely going to sit inside next time. It has a tin copper ceilings and cozy bistro tables. The bar was packed as we left at 7:30 which speaks volumes for a place on a Tuesday night. The crowd was young professionals but there was a table with this old man and his two sons that looked identical but with different coloured hair – a ginger and a brunette. Adorable. We started off with food and then moved on to drinks. We are professional, working girls! Cynthia ordered the Pulled Lamb Torpedo. I’m going to have to bring this foodie out more often! Thanks, Cynthia! I ordered the Lobster Rolls. Lobster rolls with mayo, chives and double smoked bacon. This is not the best lobster roll I have had. The mayo was used sparingly which is always a good sign. There was the light hint of citrus from lemon but I wish I had been given a wedge of lemon to give it a squeeze more. The chives were fresh but the lettuce was not as crunchy and fresh as I would have liked. The bacon was too crispy and I don’t think the smokiness worked with the creaminess of the lobster. The bun was a little too tough and the lobster did not penetrate deep enough into the bun. It was delightfully toasted though. It was good and considering the price of other lobster rolls it was not a bad price – $18/two rolls. And really, a lobster roll or two is always a good bet. Cynthia ordered the Apricot Bourbon Sour. Maker’s Mark bourbon, lime, black pepper-apricot syrup, decanter bitters and egg white. This had a sharp booze taste which was highlighted by the apricot syrup. I couldn’t taste the lime or the hint of heat that should have come from the black pepper. I always feared cocktails with egg white but we didn’t die so that fear has been conquered! I ordered the Watermelon Collins. Bombay Sapphire Gin, watermelon, basil, lemon and pink pepper-aloe syrup. This was amazing! The watermelon and basil work in tandem together to excite every taste bud in your mouth. The gin is the perfect alcohol to bring out the fruity tones of the cocktail. Bombay is made using other herbs so it is a natural choice for this cocktail. I would definitely suggest you check out this place – a combination between an old boys’ club and lounge with high quality food and drink. A great addition to the neighbourhood. Good atmosphere,great food, fantastic cocktails and of course, amazing company. Another successful food experience with one of my favourite people. The menu is almost identical (I am sure there are slight difference) and we both ordered different things then we did the first time. I want to slowly discover everything on this menu, so if you want to go to Terroni, invite me! I ordered the special – Lobster Spaghetti. This was delicious and why would it not be? It is lobster. It is pasta. The sauce was sweet, with hints of spice and citrus. The lobster was tender and flaky. I loved the addition of little tomatoes in this pasta. It added a fresh from the garden quality to the meal. Anytime there is seafood pasta on a menu, I’m all over that. Amelia ordered the Smendozzata Pizza. Tomato, mozzarella, homemade spicy sausage, Gorgonzola, and red onions. Another delicious pizza from Terroni. As always, another great meal.